2016 SAVA Tyres Bucket Nationals Round One. The 2016 Sava tyres Bucket nationals round one was a successful meeting with competitors enjoying some great racing. 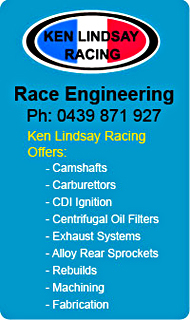 A strong contingent of North Coast racers competed and made their presence felt keeping the locals honest. The early morning light rain started to ease with practice commencing on a wet track. However when the time came for qualifying the track was starting to dry. Qualy times were down from last years which was to be expected due to the slippery conditions. 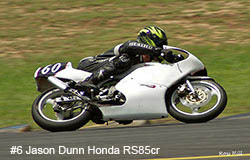 The defending Motolite Sava Tyres Bucket Nationals title holder #60 Jason Dunn (Honda RS85cr) was in scintillating form qualifying on pole and winning all three races scoring maximum points. 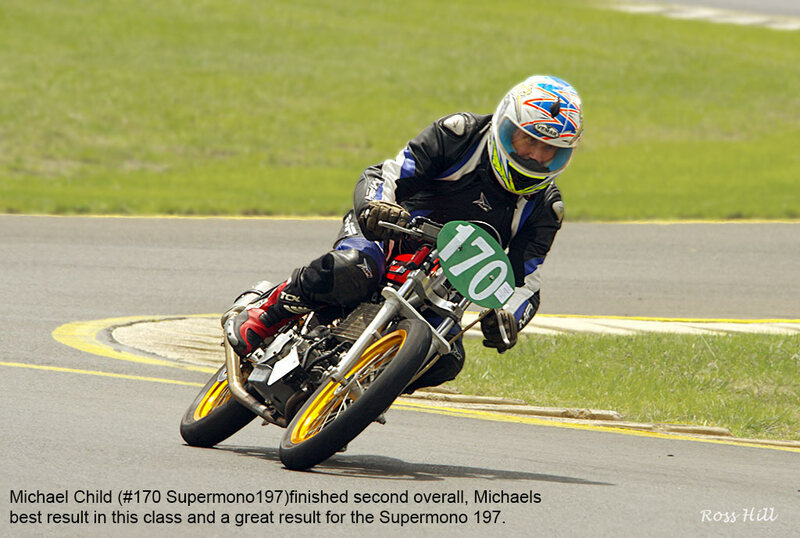 The evergreen Michael Child (#170 Supermono197)finished second overall, Michaels best result in this class and a great result for the Supermono 197. 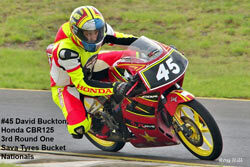 Third place went to #63 Matt Burton (Honda CBR150)who in race one had to pull out owing to a carby problem. Matt finished 2nd in races two and three but his DNF relegated him to 3rd overall. #77 Chris Jones (BBE CBR150) had a mixed day. Chris came down in the wet practice causing some damage to the bike. A frantic repair effort ensued to get the bike fixed with competitors rallying to the cause with replacement parts. Starting from the back of the grid Chris charged through to a fine second place. In race two luck was not with him as he came to a halt on the back straight so no points. In race three Chris had to do it all over again having to start from the back of the grid working his way to third to finish 4th on the day. Number 20 Blair Briggs rode the ever improving BBE Supermono 197 into an excellent third place in race one but disappointingly did not start races two and three due to a broken exhaust header. Defending Superlite title holder Tim Smith (#65 Honda CB150) got the day off to a great start with pole position. The start of race one saw #57 Stuart Ellis (Suzuki GS150) jump into the Superlite lead closely followed by #2 Ken Lindsay (KLR Honda RCB150) with Tim coaxing his bike away from the start line to slot into third. Second time around the King got past Stuart with a daring pass but it took Tim another lap to pass Stuart and set about catching King Kenny. Tim made good ground up on the flying #2 and in the process he posted the quickest Superlite time of the day. Catching is one thing passing is another in the end it was Ken first with Tim second and Stuart 3rd. Race two saw King Kenny rocket into the Superlite lead and having a convincing flag to flag win. 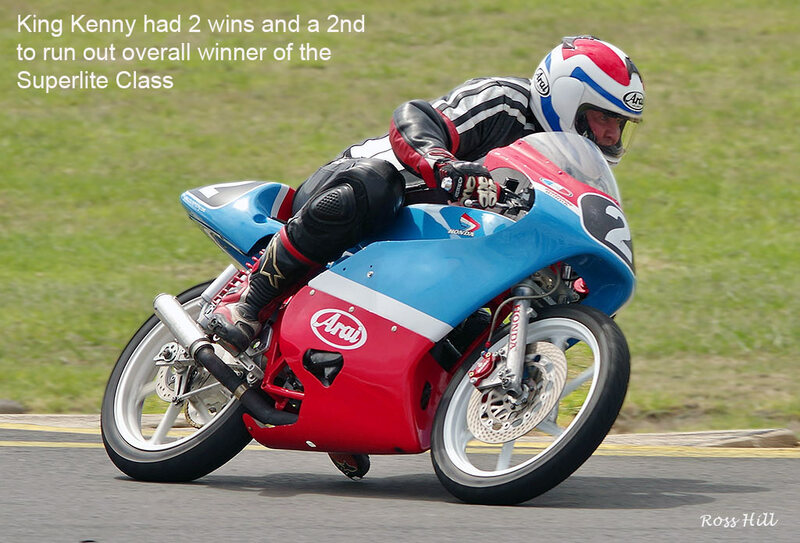 #38 Junior Murphy (BBE Honda CB150) worked his way forward from a back row start and on lap two pounced on Tim Smith but Tim had the place back next time round. Murphy left it until the last lap to challenge again and this time he made the pass stick and took the second place with Tim third. 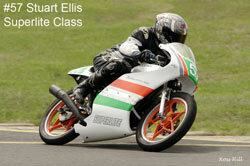 Stuart Ellis started well but fell foul of Tim and Junior on lap three and Herman nipped past on lap four. Jim Murphy and Darrell Francis locked in their own battle came home sixth and seventh respectively. Race three. Drama for Tim Smith while waiting for the pit gate to open his bike spluttered to a stop and no account of coaxing could get it to go; exit Tim. Junior Murphy Jumped into the lead in lap one and held it to the chequered flag. The King tried a few nibbles but as he had the overall win for the day in his pocket he didn't push the issue. 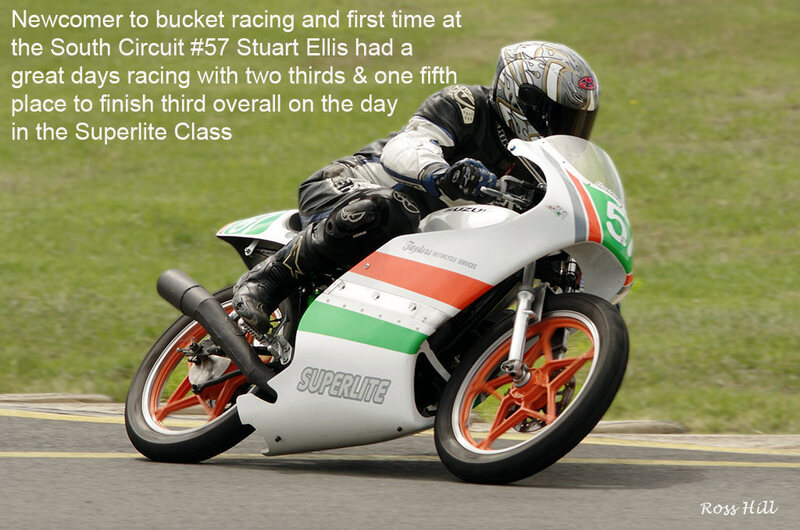 Newcomer to Superlites Stuart Ellis topped off a rewarding day with a second third place to finish third overall. Hermann Wagus came in fourth giving him fourth overall on the day. Jim Murphy and Darrell Francis were next completing a great days racing for Superlites. The CommuterLites once again put on a great show of close racing. 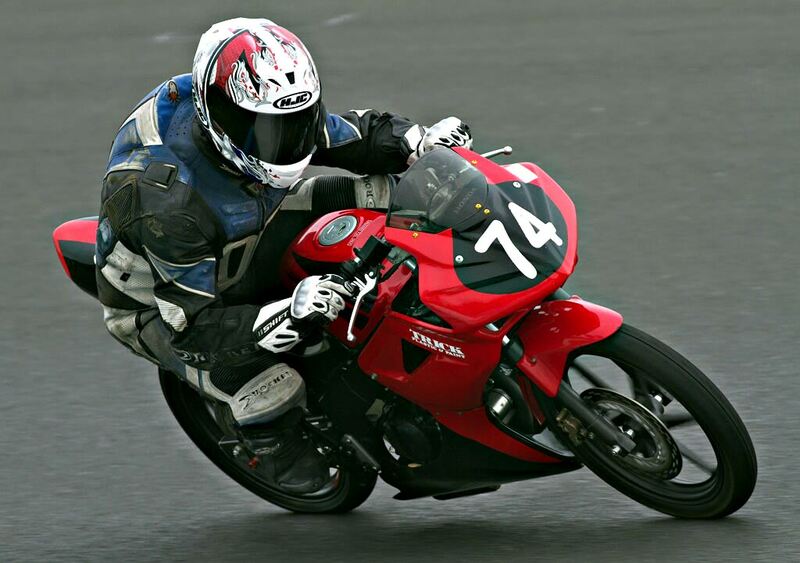 Four riders from the North Coast Road Racers club attended and made their presence felt. 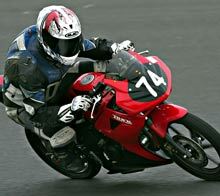 Again the popular bike choice was the Honda CBR125. 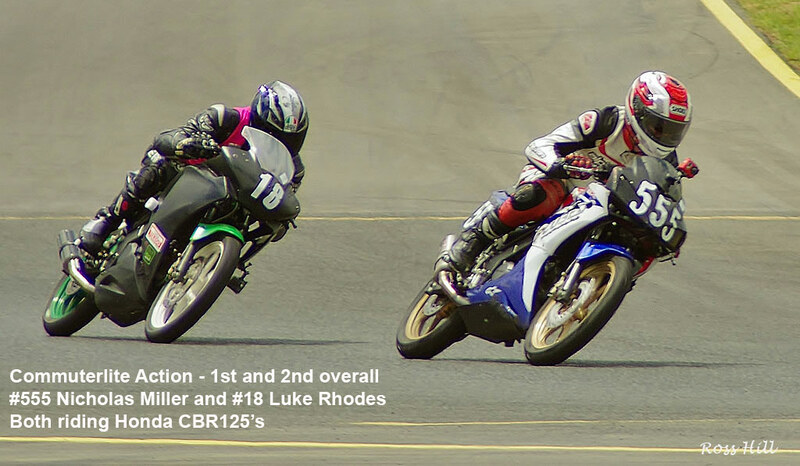 Luke Rhodes (#18 Honda CBR125) set the fastest time in slippery conditions to get his first pole position. 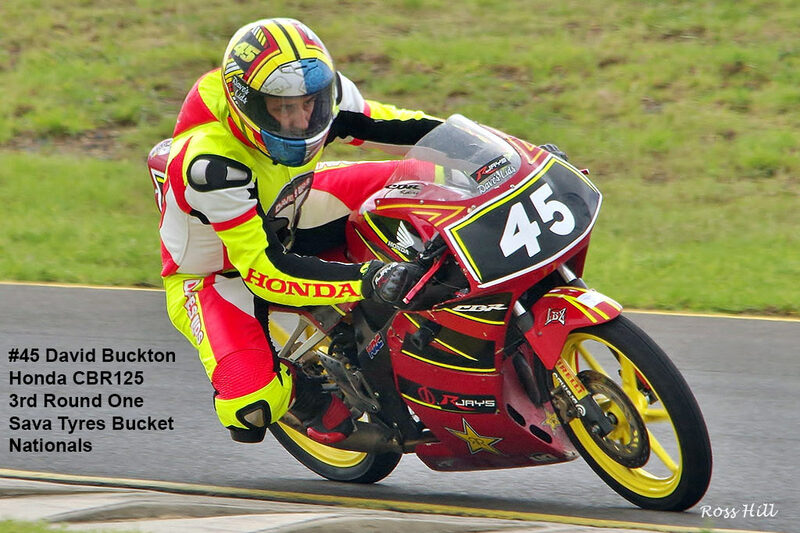 However race one saw #555 Nicholas Miller (Honda CBR125) jump into an early lead and hold it to the flag with #18 Luke Rhodes (Honda CBR125) and #45 David Buckton NCRR (Honda CBR125) engaging in a fierce battle for second place with Luke getting the place in the end. 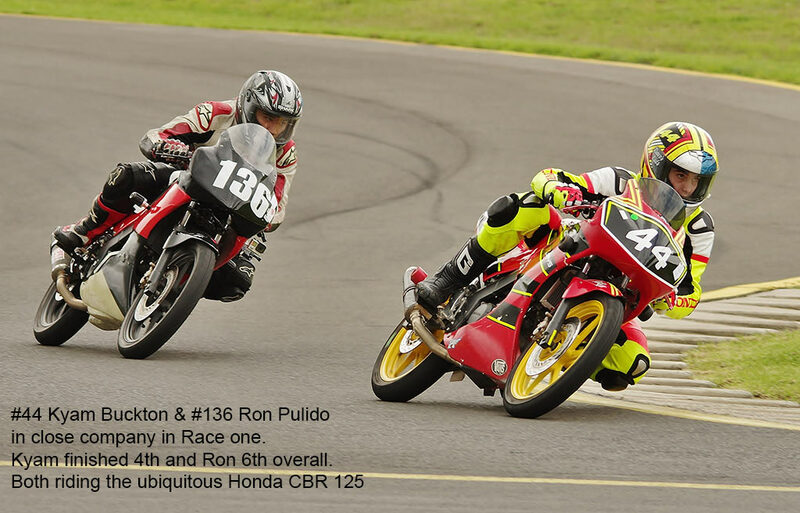 #131 Rez Pulido (Honda CBR125) had a untroubled run into fourth place. Meanwhile #44 Kyam Buckton (Honda CBR125) NCRR and #7 Adam Barnett (Honda CBR125) NCRR were swapping places with Kyam getting the fifth spot. Next came #136 Ron Pulido (CBR125) followed by #5 Michael lemon (Honda CBR125) with #34 Mark Bunting (Honda CBR125) NCRR ninth and #10 James Wain (Honda CBR125) rounding out the top ten. Newcomer #73 Daniel Florence (CBR125) enjoyed his first day at of racing and his lap times came down as the day progressed. #66 Andy Lewer (CBR125) slipped off at the hairpin but quickly got going again to finish the race. 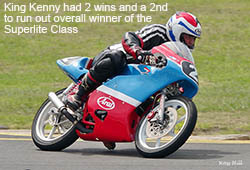 Andy didn't compete in races two and three because of bike damage and some swollen fingers. Race two saw a mighty battle between Nick miller and Luke Rhodes with Nick getting the win by a whisker. 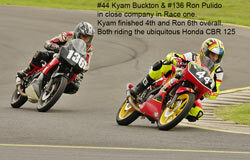 Keeping it in the family Kyam and David Buckton battled over third place with David getting the final podium position. Another family affair the Pulido brothers Rez and Ron were doing some serious dicing but Adam Barnett came along and spoiled the party by splitting them at the finish. The remaining finishing order was Michael lemon, Mark Bunting, James Wain and Daniel Florence. There was no stopping #555 Nicholas Miller (Honda CBR125) in race three, try as he might #18 Luke Rhodes (Honda CBR125) could not close down the triple five machine. On lap two Luke dropped down to fourth with both Kyam and David Buckton (NCRR) getting past. The battle raged on with Luke recovering to second and Kyam getting the better of David to finish third and fourth respectively. Ron and Rez Pulido were in close company in fifth and sixth place until Rez had #7 Adam Barnett and #5 Michael lemon squeeze past in lap two. However Rez recovered both places and almost caught brother Ron on the line. #7 Adam Barnett (NCRR) finished a gnats whisker behind those two. Next home was #5 Michael Lemon followed by #34 Mark Bunting (NCRR), #73 Daniel Florence and #84 James Wain. Final Results Table for SAVA Tyres Bucket Nationals Click Here..